Ah, the golden summer of American footie rolls on. First, the women’s national team rampages across Canada, shutting out the world and ending up with individual covers of the same magazine. And now, the men are cruising through the CONCACAF Gold Cup competition — a tournament that, I will grant you, had eluded me for most of my career. However, it seems to be such a big-deal pile of initials that 40,000 people will show up in Baltimore on a day halfway between Gobi Desert and blast furnace to watch the United States dismantle Cuba, 6-0, in a game that ended for all practical purposes in its first two minutes. (The absence of any side from Central America in the doubleheader was said to have held attendance down.) No game seems as much like a mismatch as one that has the winning coach still warning his team about overconfidence a half-hour after the game is over. Clint Dempsey put the United States ahead for good barely four minutes into the game, heading in a lovely cross from Timmy Chandler. The next two goals — a waltz through the Cuban defense by Gyasi Zardes and a neatly lofted chip by Aron Jóhannsson — were straight out of a layup line. The Cubans looked exhausted, fading into virtual invisibility with almost an hour of play left. There was a reason for that besides the ungodly heat. Like all Cuban national teams over the past few decades, the soccer team faced a problem of Cuban athletes that didn’t want to be Cuban athletes anymore. Over the course of the tournament, four Cuban players had simply walked away, in search of whatever they couldn’t find at home. Coach Raúl González was not only overmatched, which was to be expected — he was completely overwhelmed. As lopsided as it was, this match took place as the old, frozen relationship between the United States and Cuba was finally starting to thaw. This counts for something, no matter the final score. It’s quite a thing, even in a rout of a soccer game, even through the imperfect window of international sports, to see a little bit of the world changing. One of the most remarkable things I ever saw came after the men’s basketball gold-medal game at the 1988 Olympic Games in Seoul. It was contested between two countries that would not exist for very much longer — the Union of Soviet Socialist Republics and Yugoslavia (the United States team having been dispatched in the semifinals by the former). The heart of the Soviet team was two Lithuanians — Arvydas Sabonis, the immensely talented center, and Sarunas Marciulionis, a gifted and personable shooting guard. For its part, the Yugoslavian team included Vlade Divac, Dino Radja, Toni Kukoc, and Drazen Petrovic. Later, after the entire world had changed, all of these players would end up in the National Basketball Association. After the medal ceremony, and after the mandatory press availability, it fell to a little guy in a bad suit to corral the Soviet players to go wherever the hell they were supposed to go. It was generally assumed that the little guy in the bad suit was in the employ of one of those terrifyingly initialed Soviet government agencies — NKVD, GRU, KGB — redolent with the smell of cordite in the dank cellars of the Lubyanka. While we all watched in amazement, the two Lithuanians ignored this guy and, laughing, went their own way. (If memory serves, Sabonis had a case of beer under one arm.) Later, we learned that Marciulionis had arranged for a separate team photo for the Lithuanian players on the squad — which was still a considerably brave risk to take in 1988. I don’t gamble much, but if I had gotten decent odds that day on the proposition that what I had been raised to refer to as “the Soviet bloc” was in imminent danger of collapse, I would have jumped all over it. 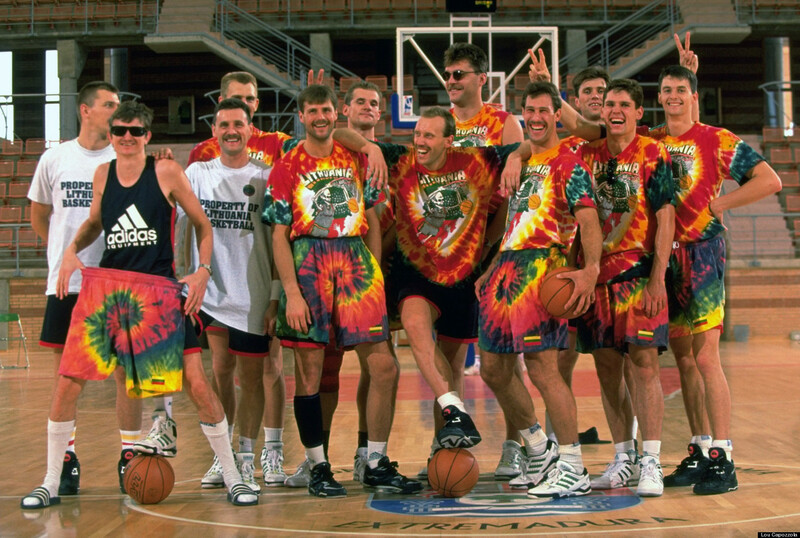 By the next Olympiad, in Barcelona, Sabonis and Marciulionis were playing for a free Lithuania, festooned in tie-dyed gear designed by Marciulionis’s pals in the Grateful Dead. They won the bronze-medal game, beating a team from what was called the Commonwealth of Independent States — all that was left of the Soviet Union and its dynastic sports machine. This is the way the games change when the world does, and, if you look very closely, you can see the world starting to change in sports before it starts to change anywhere else. The history of the United States and Cuba is not as rigidly militarized as the relationship between the Soviet Union and Lithuania once was. The United States has meddled with Cuba through the centuries, usually to no good purpose at all. One of the more benign results of this meddling was the influence of American sports in Cuba — most notably baseball, which came to the island in the 1860s courtesy of Cuban students who were then studying in the United States. The game prospered on the island through the decades. I remember chatting with old-time baseball writers who talked about going to the Fredo Corleone–Johnny Ola Havana to cover spring training games. Then the revolution came, and professional sports were outlawed and amateur sports encouraged. Once severed from its principal patron across the sea, Cuba and its sports teams fell on hard times. Defections became more common. Soccer came far more slowly to Cuba. The island is isolated from Central and South America, so the game did not sweep through it the way that it did those places. The first official soccer match in Cuba was not played until 1911. There was respectable enthusiasm for the game within the country, but Cuba never has had much of an international presence. A disastrous trip to the 1938 World Cup in France resulted in an 8-0 loss to Sweden and one of the more unkind analyses in the history of sportswriting. “Up to five goals is journalism,” wrote a French reporter. “After that it becomes statistics.” After the revolution, soccer existed in a strange space outside the heavily systemized model of national sports that Cuba imported from Russia. This month, the United States and Cuba announced that the two countries would reestablish full diplomatic relations with one another. This came after a steady thawing of relations, of which sports was a considerable part, albeit in many cases through the defection of Cuban baseball players to the United States. This phenomenon, as we saw this weekend, has had an impact on Cuban soccer as well. It is possible that, once relations are fully established, there will be enough money coming into the Cuban economy to make it possible for Cuban athletes to make a living there, and that playing against better competition will improve the Cuban teams. Some of that, anyway, is what happened in Europe when the wall came down. The problem, of course, is that, transformed by giant multinational corporate partners, the modern globalist model of national and international sports is a great galumphing beast. (And, as we have seen, that model has manifested itself in international soccer as a great, galumphing, and baroquely corrupt beast, in which alleged organized crime somehow married itself to human rights disasters.) Cuba has managed to maintain its national identity against the efforts of 11 different American presidents to dislodge it. Now, it’s possible that the price for inclusion in the world will be a great piece of that identity. After the game on Saturday, a Cuban defender named Andy Vaquero stopped to chat on his way to the team bus. It had not been a good day for Cuban defenders, but Vaquero seemed happy just to have reached the Gold Cup quarterfinal, and he also seemed happy just to be going home. Andy Vaquero is right to be cautious. The dawn of a new day can blind you to what is really going on, and it can blind you to the melancholy result: By being invited in at last, something essential about Cuba is going to be left behind.